Simple Sign In or Data Collection? When deciding on a patient kiosk you need to consider design and purpose. The first thought is to replace the sign in sheet. Quickly, thoughts move to a kiosk that will make patients verify their personal information, update their medical history, check their insurance, take their co-pay, print a receipt. sign a waiver and then ask what symptoms they are having. All this before they get to see anyone in the office. While these are all great ideas, but is it the most efficient way? How long will it take to sign in? How many patients per hour will one machine handle? How many kiosks will you need? Is your lobby big enough? Does every patient have to go through the same process? How much of this information can be collected by the patient portal? How much will it save vs how much it will cost? First and foremost, the kiosk needs to get patients in the office and notify the staff without interruption. The staff needs to know who they are and why they are at the office. Each entry needs to be time stamped.Every kiosk screen or process beyond this point needs to be weighed for efficiency. The longer it takes, the less patients your office can handle. If you are going to ask them to read a HIPAA privacy statement onscreen, consider that it will take time or they may have questions. Also consider that they have now monopolized the sign in system and nobody else can sign in unless you have mulitple kiosks. If it takes 5 minutes at the kiosk you can only handle 12 patients per hour. 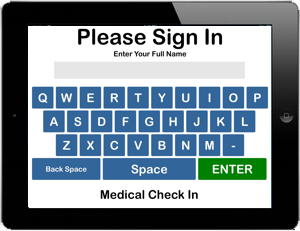 If you want them to fill out patient forms on screen, remember that a touch screen is one finger typing and takes longer. It may take a while to fill out forms depending if they have the information handy. And then, will they fill them out accurately enough to avoid a denied claim? Could those forms be filled out faster at the patient portal before they arrived? What percent of patients fill out forms every visit? One way to make the office more efficient is to determine which patients take longer than others and separate the part that makes them take longer than usual. For instance, filling out forms. Most patients do not need to fill out a bunch of forms on a return visit. They only do this on their first visit or if there is some major change to their account. Even then, if its just an insurance change, it is faster to have the trained receptionist make the change in your EMR than to have a patient work in a software they are unfamiliar with. The bigger point is that the patient sign in kiosk is not the place to collect information other than the basics. It takes too long and ties up your kiosk so others cannot sign in. All data taking should be done on other computers. Patient Portals are a part of meaningful use. If you already have one, consider putting a PC in the lobby for filling out the needed patient forms and demographics. This will separate the sign in process from the data acquisition and allow the faster patients to move through quickly. It will also reduce the cost of the kiosk.